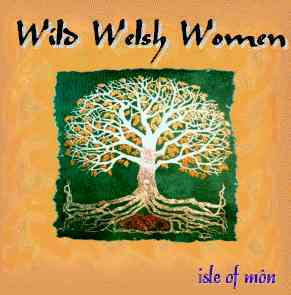 Wild Welsh Women's first album "Isle of Môn" is a collection of songs, both original and covers, from the Celtic world and beyond. The self penned material draws on many sources including a journey through Welsh history in the title track 'Isle of Môn' (Anglesey); narrative tales of famous and not quite so famous historical figures, Daisey Bates & Amelia - about the pioneering pilot Amelia Eirheart; and personal tributes (Father). Among the material by other writers is a version of the Pete Seeger '60's classic 'The Bells of Rhymney' - with lyrics written by Welsh poet Idris Davies, the Wild Welsh Women have reclaimed the song for the motherland!. Also featured are songs by Mike Scott, Dougie McLean, and Kate and Anna McGarrigle. The album also features guest appearances by fiddle player Feliks Tabis, piper Paul Collins & flautist Hannah Morris (Rob & Rozi's daughter).